Again come, that fixing our mind intently upon the Evangelic Scriptures, we may behold the beauty of the truth. Come let us direct the penetrating and accurate eyes of the mind unto the mystery of Christ; let us view with wonder the admirable skill of the divine economy: for so shall we see His glory. And thus to act is for our life: as He Himself assures us, when speaking unto God the Father in heaven, "These things are life eternal: to know Thee Who alone art true; and Jesus Christ, Whom Thou hast sent." How therefore was He sent? and what was the manner of His coming unto us? For being by nature God that filleth all, how, as the blessed John the Evangelist said, "was He in the world," Himself being Lord? And how was He sent by the Father, when as God He is the Creator and Sustainer of all things? for all things were established by Him. The wise John the Evangelist then teaches us, saying, "And the Word was made flesh." But perchance some one will say, 'What then? Having ceased to be the Word, did He change into being flesh? Did He fall from His Majesty, having undergone a transformation unto something which previously He was not?' Not so, we say. Far from it. For by nature He is unchangeable and immutable. In saying, therefore, that the Word became flesh, the Evangelist means a man like unto us. For we also are often called flesh ourselves. For it is written, "And all flesh shall see the salvation of God," meaning thereby that every man shall see it. While therefore He immutably retains that "which He was, yet as having under this condition assumed our likeness, He is said to have been made flesh. But yes! perchance some one will say, who has been ill instructed in the faith, 'Was it then God the Word that was baptized? Was He in need of being made partaker of the Holy Spirit? Not at all. Therefore it is that we affirm, that the man who was of the seed of David, and united unto Him by conjunction, was baptized and received the Spirit.' The Indivisible therefore is divided by you into two sous: and because He was baptized when, thirty years old, He was made holy, as you say, by being baptized. Was He therefore not holy until He arrived at His thirtieth year? Who will assent to you, when thus you corrupt the right and blameless faith? For "there is one Lord Jesus Christ," as it is written. But this we affirm: that He was not separate from Him, and by Himself when baptized and made partaker of the Holy Spirit: for we know, both that He is God, and without stain, and Holy of the Holy: for we confess that "of His fullness have all we received." For the Holy Spirit indeed proceedeth from God the Father, but belongeth also to the Son. It is even often called the Spirit of Christ, though proceeding from God the Father. And to this Paul will testify, saying, at one time, "They that are in the flesh cannot please God: but ye are not in the flesh, but in the spirit, if so be the Spirit of God dwelleth in you. But if any one have not the Spirit of Christ, he is none of His." And again, "But because ye are sons, God hath sent the Spirit of His Son into your hearts, crying, Father, our Father." The Holy Spirit therefore proceedeth indeed as I said from God the Father, but His Only-begotten Word, as being both by nature and verily Son, and resplendent with the Father's dignities, ministereth It to the creation, and bestoweth It on those that are worthy. Yea verily He said, "All things that the Father hath are mine." 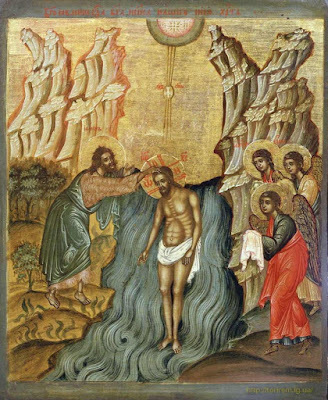 But let us retort upon those who pervert the right belief this question; 'How can He Who received the Spirit, if He be, according to your phrase, a man, and the Son separately and by Himself, baptize with the Holy Ghost, and Himself give the Holy Spirit to them who are baptized?' For to be able to impart the Spirit to men suiteth not any one whatsoever of things created, but, together with God's other attributes, is the distinct property of Almighty God alone. But He Who gave It was man: for the wise John said, "After me cometh a Man, Who was before me ... He shall baptize you with the Holy Ghost and with fire." As therefore it is unbefitting God the Word, regarded as God the Word, to draw near unto holy baptism, and be made partaker of the Spirit, so in like manner it is altogether incredible, or rather impossible to believe that the ability to baptize men with the Holy Ghost, is the act of a mere man with nothing in Him superior to ourselves. How then will the mystery be true? In that for our aid He assumed a kind of adaptation. The divine Word became man, even "He Who was in the form of God the Father, and thought it not robbery to be equal unto God," as most wise Paul says, "but took the form of a slave, being made in the likeness of men, and humbling Himself to poverty." Enquire therefore Who He was that was first in the likeness of God the Father, and could be regarded as on an equality with Him, but took the form of a slave, and became then a man, and besides this made Himself poor. Was it He of the seed of David, as they argue, Whom they specially regard separately and by Himself as the other Son, distinct from the Word of God the Father? If so, let them shew that He ever was on an equality with the Father. Let them shew how He assumed the form of a slave. Or what shall we say was that form of a slave? And how did He empty Himself? For what is poorer than human nature? He therefore Who is the exact image of God the Father, the likeness, and visible expression of His person, Who shines resplendent in equality unto Him, Who by right of nature is free, and the yoke of Whose kingdom is put upon all creation, He it is Who took the form of a slave, that is, became a man, and made Himself poor by consenting to endure these human things, sin only excepted. And the Evangelist says that the heavens were opened, as having long been closed. For Christ said, "Forthwith shall ye see the heavens opened, and the angels of God ascending and descending upon the Son of man." For both the flock above and that below being now made one, and one chief Shepherd appointed for all, the heavens were opened, and man upon earth brought near to the holy angels. And the Spirit also again came down as at a second commencement of our race: and upon Christ first, Who received it not so much for His own sake as for ours: for by Him and in Him are we enriched with all things. Most suitably therefore to the economy of grace does He endure with us the things of man's estate: for where otherwise shall we see Him emptied, Whose in His divine nature is the fullness? How became He poor as we are, if He were not conformed to our poverty? How did He empty Himself, if He refused to endure the measure of human littleness? Having taken therefore Christ as our pattern, let us draw near to the grace of holy baptism, that so we may gain boldness to pray constantly, and lift up holy hands to God the Father, that He may open the heavens also unto us, and send down upon us too the Holy Ghost, to receive us as sons. For He spake unto Christ at the time of holy baptism, as though having by Him and in Him accepted man upon earth to the sonship, "This is My beloved Son, in Whom I am well pleased." For He Who is the Son by nature and in truth, and the Only-begotten, when He became like unto us, is specially declared to be the Son of God, not as receiving this for Himself: - for He was and is, as I said, very Son: - but that He might ratify the glory unto us. For He has been made our firstfruits, and firstborn, and second Adam: for which reason it is said, that "in Him all things have become new:" for having put oil the oldness that was in Adam, we have gained the newness that is in Christ: by Whom and with Whom, to God the Father, be glory and dominion with the Holy Ghost, for ever and ever, Amen.